Have You Signed Up For DemoCamp05 Yet? I write that title, and then I think, “What a sec, have I?”. Battledecks will be back, oh but of course. Linda Bustos has already submitted one deck and we’re just waiting to hear back from a “potential”. Any volunteers to get up there, loosen up your Thursday evening and get into an impromptu 3 minute very fun, very funny presentation battle? Drop a note. If you are planning to demo, head over and throw your name down on the wiki, and don’t forget to add youself to the Facebook event page as well. I think Boris has likely been busy drumming up folks to demo from his perch at Web Directions North. Please, step up – we know there’s a TON happening in this town – we would all like to hear about it and support it! Sticking with TV Fame, Episode 140 of The Lab With Leo Laporte airs today on G4 Tech TV in Canada (The How-To Channel in Australia). Michael does a segment with Leo, talking about designing and building applications in the era of social networking. 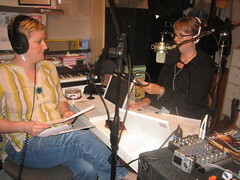 That interview will be made available on The Lab website after it airs on television. From “Launch” to “Garage”, techy event speaking. The Kinzin team spent the better part of their Friday evening at Launch Party Vancouver 03, showing off the application These Are My Kids. If you haven’t read or heard what this latest app is all about, please read more here. It was a fantastic evening, to say the least. Michael, Frank, Julie and Paul held court all night to the many new fans wanting to find out more, take a look at the interface and have a spin for themselves. We are extremely grateful for the interest and enthusiasm for These Are My Kids from those of you who attended, and we very much appreciate the time that each person gave to learn more about it. It is an incredibly rewarding feeling to have such a great tech community come to such an event and to support the work that is being produced. It was inspiring and exciting. A quick, but very necessary thank-you to the organizers of LPV: Maura, Danny, Dimitri; and to the sponsors as well: Sun Microsystems, Strutta, Techvibes, Layer7, QC Docs and Growthworks. This event is a treat. Looking forward to the next. I just joined another social network, shocking, I know, but this one is different and even a little extra special. Happyfrog.ca is a Vancouver-born network that is starting to nurture their sustainable community through conversations, knowledge-sharing and every day practical tips, with a focus on green and healthy living. My first go at the community was, in a word, really fun. And that’s not just because that’s what their logo tells me to do. The next word I’d use to describe my inaugural experience: useful. Practical is another. HappyFrog.ca truly is a user-generated space online, with its’ members providing the knowledge that the rest of us benefit from. It’s not too long before you can’t help but give a review or cast a vote. And why not? You’re directly contributing to your community. Reviewing a yoga studio, a physiotherapist or a park not only helps other consumers, but also provides small businesses and green organizations with feedback, promotion, and no doubt helps them generate more ideas to better serve the community. The topic directory has pretty much listings on everything from eco travel to naturopaths to restaurants to spas. It’s all there. And rated by all of us. So it’s real. Be sure to visit “Ask the frog” – this is a fantastic feature. It’s the site’s community Q&A – “dark greenies” can share tips with “light greenies”. (And then we all get beamed up by Scottie.) It’s pretty cool – users can throw any question out to the masses and get thoughtful responses from random users, so you’re meeting and conversing with other people using the site as well. You can also post events, add your blog to the blogroll, and what’s even better, small businesses and organizations can post their logos, business ideas and descriptions and promote themselves to the site – at zero cost. It’d be great to get more people on the site, contributing to a greener, sustainable community by being a member and help direct the rest of the community to a healthier Vancouver: Go Green, Frogs! 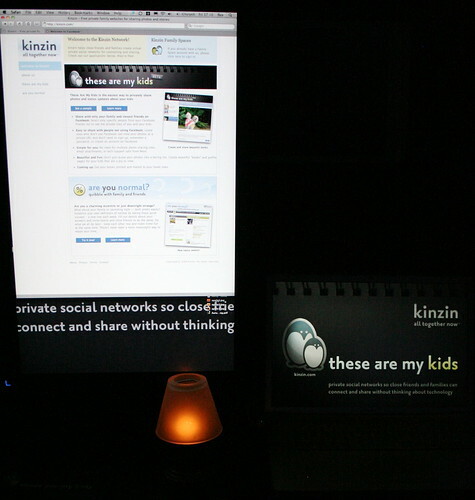 Kinzin’s newest application, “These Are My Kids”, is ready. Almost. The latest app from Kinzin is currently in the Beta phase, soon to make the leap to full launch. The app is quite stunning as-is in every way, in design and technology – it’s easy, efficient, creative, useful, private and fun – but we’d like to perfect it, so we need your help and your feedback. Resolves all of your photo headaches and problems of multiple publishing networks and accounts – it’s an all-in-one! Add “These Are My Kids” here and let us know what you think! You can comment within the application (there is a prompt along the top of the app), or join the Beta Testers Group for the app and comment in the Discussion Board. It’s scary. This could actually carry some truth to it! Coming out of the holiday season, the women in the Vancouver Tech world were welcomed into 2008 by a gracious (and overdue) blog post, written by Krug, and compiled and inspired as a collective effort with Dave O.. Speaking of “Women Who Tech”: this is a TeleSummit event happening at the end of March that I think could be interesting for all you women out there. Currently, it is only available to US residents, but the organizers have ensured me they are working on having Canadians enabled to participate as well. You can make a panel suggestion for the event here.